You have probably heard of the incredible wedding gowns that Veromia design, but did you know they also produce occasion wear for women? For the last eighteen years this exceptional designer has been turning parties into celebrations with modern, stylish dresses. In fact, the demand for plus size clothing from Veromia was so great they created two high fashion collections for curvy women. Whether you’re in search of that perfect mother-of-the-bride outfit or simply want a sophisticated dress for your next garden party, look no further than Veromia! See more from this great brand below. With nine collections to choose from it is difficult to decide which products to stock, but every garment of Veromia’s that Beige Plus sells is truly stunning and sure to make you feel like a goddess. Like Beige, Veromia believes that every day is an excuse to dress up and act like you are strutting the runway, even if you’re popping to the shops for a pint of milk. You will love your new Veromia dress so much, you won’t want to take it off! 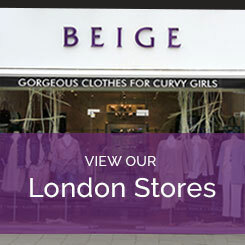 Speak to a Beige Plus assistant today at one of our London based shops, or call us on 020 8455 5888 to speak to one of our customer advisers today.